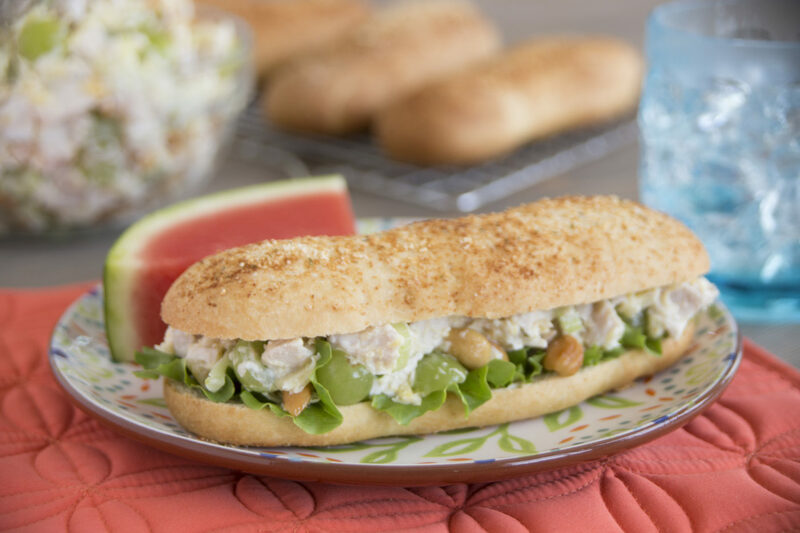 These delicious breadsticks with chicken salad stuffed inside are sure to be a hit at any luncheon or picnic. Roll each Texas roll or 2 dinner rolls combined into a 6 inch rope. Place on a large sprayed baking sheet. Brush each one liberally with butter. Sprinkle lightly with Parmesan cheese and garlic salt. Cover with plastic wrap and let rise until double in size. Remove wrap and bake at 350º F 15-20 minutes. Combine mayonnaise and lemon juice. In a separate bowl, mix remaining ingredients, except cashews and lettuce. Pour mayonnaise mixture over chicken mixture and fold together. Salt and Pepper to taste. Allow to chill in refrigerator 1-2 hours. Just before serving, add cashews. Slice breadsticks and fill with lettuce and chicken salad.